Sharp is arguably the world's best producer of LCD TVs with the stellar product lineup of its flagship Aquos series. What can't be argued is that Sharp is the world's largest volume manufacturer of LCDs. 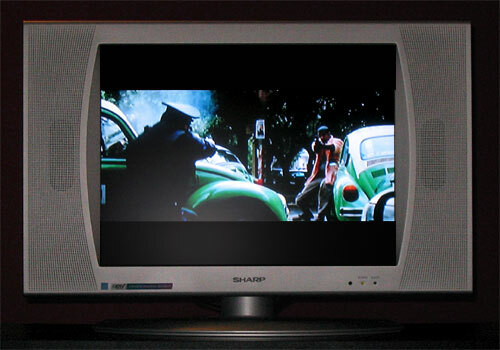 Many of Sharp's sales are of non-Aquos displays, like the LC-20SH4U LCD TV, which offers budget-conscious consumers a well-performing EDTV LCD display. When buying a low cost Sharp display from high-end manufacturer, as opposed to a no-name brand, consumers benefit from the trickle-down effect. Car technologies, like remote keyless entry systems and airbags, that in the early 90's were only available on imports costing upwards of $100,000 can be had in cars today for less than $15,000. LCD TV technology has been advancing much faster than automotive technology and during the past few years and Sharp, the inventor of many LCD manufacturing technologies, has had the most time to refine and perfect their flat-panel manufacturing process. For consumers this means low-cost TVs that are made from a quality panel component. The LC-20SH4U LCD TV is a new product offering with an introductory date of February 2005. It does not replace an existing model. For those not in need of HD-native resolution, this display stands out in a crowded field of competitors. The Sharp LC-20SH4U LCD Television is a competent TV with accurate color reproduction and a clear picture in both bright and dim rooms. The LC-20SH4U is at its best displaying bright scenes. During dark scenes, its picture quality lags as detail and nuance disappear and blocky chunks of black take their place. Poor performance in dark scenes is an inherent shortcoming of low-price LCD TVs and the LC-20SH4U's performance meets or exceeds its competition. The LC-20SH4U does an excellent job at curbing glare from any angle or source. I found that the default picture settings of the TV failed to maximize the display's potential. While watching my test DVD, Man on Fire, which contained many dark scenes and would give even the best LCDs a thorough workout, the display consistently lacked detail on this LCD panel at the factory preset settings. Turning up the brightness from zero to +10 on a -30/+30 scale improved detail in the dark areas of scenes, while turning the color up to +5 improved upon skin tones. Decreasing the sharpness setting -5, on a different -10/+10 scale, resulted in more realistic picture over time. Leaving the contrast at the factory setting of +40 (0/60 scale) worked best for maintaining dark blacks. Like most LCD TVs, this unit ships from the factory with the backlight setting turned to its maximum—unnecessary since the LC-20SH4U's image was clearly visible at half brightness in a well-lit room. In all but the brightest of rooms users will probably want to dim the backlight to prolong the bulb's life, which is rated to last 60,000 hours at 50 percent brightness. Rounding out the inconsistent use of scales, backlight setting operates on a 1-17 scale. Unlike dark scenes, this LCD Television was an exceptional performer during bright scenes. When Man on Fire shifted to a swimming competition the image perked up considerably as bathing suits and pool water in the midday sun were conveyed in vibrant color. Likewise, while watching a broadcast documentary on whales I couldn't help but appreciate the rich detail in the underwater landscape and the display's vivid image. Displaying a down-sampled 1080i broadcast signal at 480p yielded DVD-like accuracy. Displaying non-HD broadcast material the image quality suffered at times to the point where it exhibited the lack of detail that would be expected of a poor quality VHS tape. This deficit was as much a symptom of the broadcast as of the display. Sharp's specifications list a 170-degree viewing angle for the display, but I found that outside of 110 degrees subtle detail in the documentary's bright underwater scenes was lost. Still, scenes were clearly visible to the advertised 170 degrees—those people not looking for detail in a coral reef while standing 85 degrees off center won't be disappointed with the display's performance. For this price range, a potential buyer will not find an LCD television with better viewing angles. The Sharp LC-20SH4U LCD, which has a native resolution of 640x480, displayed wide-screen DVD images very well. There are four aspect ratio settings, which Sharp places under the "view mode" menu: 4:3, 16:9, ZOOM, and Stretch. We found the native 4:3 did a nice job displaying the contents of our anamorphic, widescreen DVD. For those using the display in a larger room, unable to afford the display space lost to bars across the top and bottom of the image and willing to sacrifice the director's artistic vision, the zoom mode does a decent job of enlarging the image. The other settings do little to improve the image on this EDTV/SVGA LCD display. The LC-20SH4U's inputs, menu system, remote, and sound quality are what you would expect for a display its price: all are adequate but none are exceptional. A standout feature of this display is its forward and rearward pivot, a nicety that is absent from some displays in Sharp's more expensive Aquous line. The display measures 24.5 inches wide, 17.5 inches tall, and 8.5 inches deep at the base (the actual display portion is less than 4 inches deep). The display can pivot forward a slight 2.5 degrees and backward up to 10 degrees. This flexibility, coupled with the display's excellent viewing angles, affords the user many installation options. While the device doesn't have a side-to-side swivel, shifting the featherweight unit (about 15 lbs) from side to side is easy. Also, since the display runs exceptionally cool, users won't have to worry about grabbing onto a hot-spot while adjusting the screen to find the perfect placement. Given the substantial space allocated to the unit's speaker bezel, I was disappointed with overall sound quality delivered from the paltry 1-watt speakers. The small speakers came far from inducing the aural-induced terror the directors of Man on Fire intended us to experience during vicious kidnapping scenes, filled with children screaming and plentiful gunfire delivered a la Denzel Washington. Also, in a dimly lit room with an off-center source of light, one side of the bezel reflected the light off its silver-plastic surface while the other fell dark, creating the illusion of a non-uniform frame around the screen. The online menu on the LC20SH4U TV functions as a system of drop down menus, overlaid across the image. Navigating the menus with the included remote control was easy. Sharp engineers obviously had to make tough decisions about what controls to include and exclude on remote to keep its size down. Why easy access to the picture flip control warranted a button while there was no button to change the aspect ratio baffled me. With that notable exception, the remote was overall pleasant to use. The LC-20SH4U has three inputs: a cable/antenna coaxial input, a component video RCA input, and a composite video RCA input. A cable corral at base of the TV's stand helps concentrate wires behind the stand and prevents an unsightly spaghetti mess from hanging behind the display. There is no DVI or VGA connector, thus this LCD Is to be used only as a television-viewing device and not with computer Input.